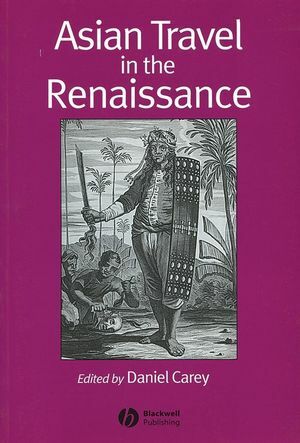 Asian Travel in the Renaissance looks at travel in Asia for the purposes of trade, colonialism and religious conversion by a diverse array of Portuguese, Dutch, Spanish, Italian and English protagonists in the Renaissance era. Examines European travel in Asia from a variety of perspectives. Presents new research by international scholars. Establishes the importance of Asia as a place of aspiration in the early modern period. Daniel Carey is Lecturer at the National University of Ireland, Galway. He has edited a ‘Les voyages de Gulliver: Mondes lointains ou modes proches’ (2002) and is Editor of the journal Eighteenth-Century Ireland. 2. Alessandro Valignano: Man, Missionary and Writer: M. Antoni J. Ucerler, Sj. 3. The Transmission of Renaissance Culture in Seventeenth-Century China: Nicolas Standaert. 4. The Widening of the World and the Realm of History: Early European Approaches to the Beginnings of Siamese History, c.1500-1700: Sven Trakulhun. 5. The Spanish Contribution to the Ethnology of Asia in the Sixteenth and Seventeenth Centuries: Joan-Pau Rubiés. 6. A Truthful Pen and an Impartial Spirit”: Bartolomé Leonardo de Argensola and the Conquista de las Islas Malucas: John Villiers. 7. "Wherever profit leads us, to every sea and shore...”: The VOC, the WIC, and Dutch Methods of Globalization in the Seventeenth Century: Claudia Schnurmann. 8. Riches, Power, Trade and Religion: The Far East and the English Imagination, 1600-1720: Robert Markley. 9. The Political Economy of Poison: The Kingdom of Makassar and the Early Royal Society: Daniel Carey. Obituary – C.R. Boxer (1904-2000). "This book presents eight varied essays, each an interesting example of quality scholarly writing." "The range of primary texts examined and the depth of secondary references make the book a valuable resource for .... interdisciplinary work on Europe and Asia." "Asian Travel in the Renaissance provides some engaging studies of early modern European writing about Southeast Asia."